This wonderful mixture is out of this world! 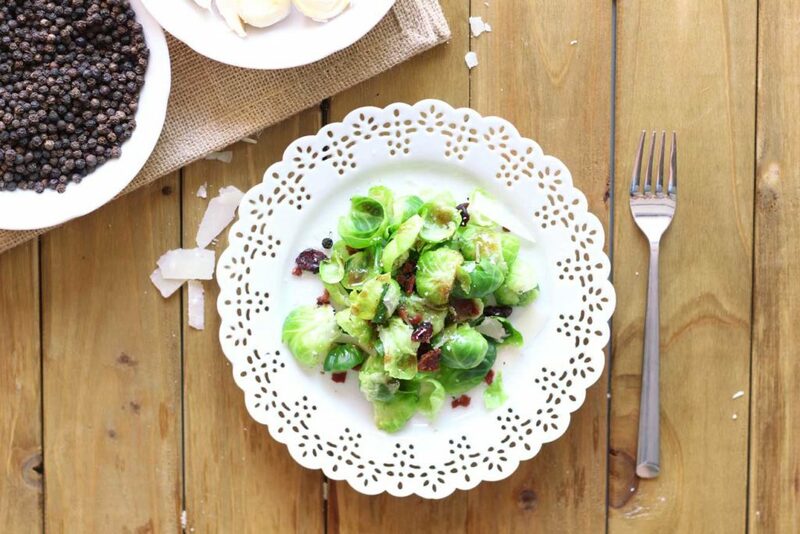 This Brussels Sprout Salad combination of balsamic vinegar dressing on the cool and crisp brussels sprouts leave your taste buds wanting more! Add a bit of bacon, dried cranberries and fresh Parmesan cheese and you have one incredible salad that pairs perfectly with so many dishes! This one is addicting! If you follow my food blog, you know I participate in a lunch coop at my office. It’s a fun little group of about 8 of us and we all pair up and cook once a month. This past month, we added two new members to our group and I’m so excited to have them and see what fabulous dishes they bring to the table! One of the guys who recently joined was up to cook this past week. He was paired with me, so we decided to do a BBQ theme since it’s so hot outside. I decided to make my St. Louis Style Slow Cooker BBQ Ribs and Tyler decided he would bring in a Brussels Sprout Salad that he was inspired by from a local restaurant. I’ll be honest…I’ve never been a huge fan of brussels sprouts. When I was growing up, everyone boiled them and dipped them in vinegar. Ok…gross! Now seriously…who likes that? The only reason adults ate the brussels sprouts that way is because they wanted the nutritional value of the brussels sprouts and they tried to bury the taste with vinegar. Ok, fine. I agree that brussels sprouts contain a ton of nutritional value. Super higher in fiber (2 grams in 1/2 cup). This helps aid in digestion. High level of Vitamin K and C.
Brussels sprouts also help lower cholesterol and help with healthy thyroid function. Contains a TON of antioxidants! So we all know they are good for you but they don’t taste fabulous!!! Ya’ll, I was curious (with my guard up), so I asked Tyler to share some of the ingredients in this salad. Tyler is a foodie and he was raving about this salad. I trust Tyler’s taste buds, so when he started explaining it…it sounded delish. When he brought the salad in and I took a bite, it was love at first bite! I mean seriously – I ate 3 servings of this salad! So, how do you make Brussels Sprout Salad and what’s in it? Let’s talk about this dressing for a minute…lightest and most simply flavored Balsamic + olive oil dressing! This is a cold salad and with any good cold salad comes a homemade dressing made from scratch. I fell in love with this homemade dressing because it calls for balsamic vinegar and dijon mustard. Two of my all time favorite ingredients in the world! Like in the WHOLE wide world! I love making dishes with balsamic vinegar bases. 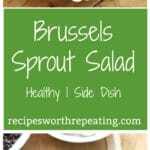 How Do You Make Brussels Sprouts Salad? This is a really easy recipe to make, but I’m still going to walk you through it step-by-step. First, you’re going to cut the ends off the brussels sprouts and discard. Peel off the leaves and rinse well in a colander. From there, you’ll get out a big pot and fill it with water. Sprinkle in some salt and bring it to a boil. While you’re waiting for the water to boil, get out a big bowl and fill with ice and water. You’re going to make an ice bath for your brussels sprout leaves. Once the water comes to a boil, add in the brussels sprout leaves in small batches and blanch for 20-30 seconds in the boiling water. 20-30 seconds is all you need for the color of the leaves to brighten, yet remain crisp. In batches after the brussels sprouts blanch, immediately skim them out and put in the ice bath. Once the leaves have cooled in the ice bath, you’ll notice how the leaves turn a bright green. Fresh and crisp brussels sprouts! PERFECT for a salad ya’ll! Once they’ve cooled, place them in a salad spinner to get rid of the excess water. Now that we have the brussels sprouts taken care of, it’s time to saute the bacon with some fresh minced garlic. I use the word “saute” because I make my Brussels Sprout Salad with Turkey bacon and when you cook up turkey bacon, there’s little to no fat. Cut that turkey bacon into bite size pieces and saute with 2 cloves of minced garlic. Once brown, set aside. It’s time for my favorite part…the dressing! Oh my heart…this dressing gets my mouth watering just writing about it! I’ll tell you why I love it so much later on, but you’re lirerally going to take all those dressing ingredients I mentioned above and mix them all in a bowl with a whisk. Now it’s time to get out a big bowl and mix all the salad ingredients together. Drizzle on some of that Balsamic Dijon dressing and you have yourself once amazingly delish side dish! Eat it up people…EAT.IT.UP. What’s The Key To Making PERFECT Brussels Sprout Salad? Ok, let’s note a few special things here about this salad. Blanching – What the heck is blanching and why do you do it? Blanching means to plunge something (a vegetable) quickly into boiling water, leave it there for 30 seconds to 1 minute and then immediately put the vegetable(s) into a bowl of ice water. You do this to regain color and help get rid of some of that bitter taste a brussels sprout naturally contains. Turkey or Pork Bacon? – The answer is EITHER! Seriously – I’ve had this salad with both turkey and pork bacon and it’s delish either way! I’ve made this dish 6 times now and tonight, I had 2 full servings. But to be honest, I could eat the entire bowl with no problem. It’s THAT good! Every bite leaves you wanting more. Who would have ever thought I would like to eat cold brussels sprouts! Blow my mind! Let me wrap this up for you. Lunch was so good that day. Tyler also made our group dessert. He made my Flourless Chocolate Torte and it finished off this meal so perfectly! Needless to say, Tyler did an above and beyond job on this lunch and now I have a new favorite salad to make at home! If he ever decides to stop being an engineer, he’d make a fabulous chef! That’s the whole reason we do the lunch coop at the office….to share recipes that are worth repeating and this one is so worth repeating. So that’s why sharing it with you! What Should I Serve With This Brussels Sprout Salad? But to be honest…this Brussels Sprout Recipe pairs well with so many dishes! Oh, and this recipe is naturally gluten free! I can’t wait to hear how ya’ll liked this recipe! SO.MUCH.YUMMINESS. DID YOU LIKE THIS POST? BE SURE TO SHARE IT ON SOCIAL MEDIA! DID YOU MAKE THIS RECIPE? LET ME KNOW HOW IT TURNED OUT BY GIVING IT A STAR RATING BELOW! This wonderful mixture is out of this world! The combination of the balsamic vinegar dressing on the cool and crisp brussels sprouts leave your tastebuds wanting more! Add a bit of bacon, dried cranberries and fresh parmesan cheese and you have one incredible salad that pairs perfectly with so many dishes! This one is addicting! Mix all ingredients for the salad dressing and set aside. Cut the stems off the brussels sprouts and peel off the outer layer of leaves. Each sprout you can usually cut the stem off, peel the outer leaves off, then cut another section of the stem off and peel another couple of layers off. You can save the brussels sprout hearts for other uses. Blanch the brussels sprout leaves; in a medium saucepan bring salted water to boil. Make an ice bath with ice and drinking water in a mixing bowl and set aside. In small batches, boil the leaves for 20-30 seconds, until the color of the leaves brighten but the leaves are still crisp. Immediately skim out and put in the ice bath. Once the leaves have cooled you can remove them to a salad spinner to get rid of the excess water. Dice the bacon into bits and then cook in as sauté pan until crispy to make your own bacon bits. Tyler added a little bit of the minced fresh garlic and some parsley while frying the bacon bits. Skim the bits out of the pan and set aside to drain. Mix the brussel sprouts leaves, bacon, and dried cranberries before serving. Use a vegetable peeler to shave parmesan cheese on to the top of the salad before presenting. Slowly pour on the salad dressing and toss to mix. Store any leftover salad in the refrigerator. NOTE: You will find affiliate links on this page. This post was also originally published in July of 2016, but was republished with an updated step-by-step instructions, pictures and tips in July of 2018. I love making salads with brussels sprouts – especially with loads of balsamic vinegar. This one is SOOO good! I’ve never liked brussel sprouts until I ate this recipe! It’s now a family favorite! Such a tasty looking salad. Sprouts with bacon go well together too. Thanks! Bacon goes well with everything! LOL! Tried it for the second time and instead of the tedious leaf separating just the the sprouts into the cuisinart…much speedier. I make it w/ our bacon and it’s really awesome! Ty for the recipe. Yeah! I’m glad you like it! I know – it’s a great way to get the brussels sprouts in !!! !